Bottle : The bottle is quite nice.. It´s a cool touch with the ribbon tied to it and it has a nice shape. Nose : The scent it pretty descent.. But there is a hint of orange already in the scent. Taste : The taste is pretty full, but there is a strong tone of orange in it.. That kill´s it for me.. Finish : Same here.. If it wasn´t for the the awful orange tone it would have been ok. If you like Zacapa 23 you will love this one..
Had a great experience with this rum, in a rum bar, and it became my first sipping rum. I must confess that I have outgrown it, and just keep it for the really cool bottle - but i will give it at good 6 (1 is for the bottle). It really smells and tastes of orange, witch i think is distinctive. En dejlig rom som kan nydes med et par isterninger. Dejlig frisk med noter af citrus. Trés interessant à decouvrir. Une belle rondeur et une approche aromatique toute en agrume. Un rhum différent a conseiller tout particulièrement aux fans de Grand Marnier. Rhum avec un gout très prononcé d'agrumes. A gouter mais il peut être déconcertant ! My expectations were high for this rum but I was surprised by the taste reminiscent of triple sec or orange liquor. Too much of it to my opinion. It is good, but it lacks the sugary flavor of cane. Nevertheless, I'm happy to have it in m'y collection shelf. When I want a change up this is it,Right here this it. This is top shelf for personal or your Family. Had this a while ago, but it should be mixed with cola or other mixes as I found it to be fairly rough around the edges, so-to-speak. Tastes like it is perfect for pirates to keep away scurvy. Little harsh but I have always had a bottle on hand since 8 years ago. Can be used as a good mixer if you want to add a little orangey rum flavor. Tried it neat. Good sipping rum. Enjoyable complexity, with a fair amount of sweetness. Exceptionally smooth! Great finish. This rum is best drunk straight! Sip it straight up! Great finish. 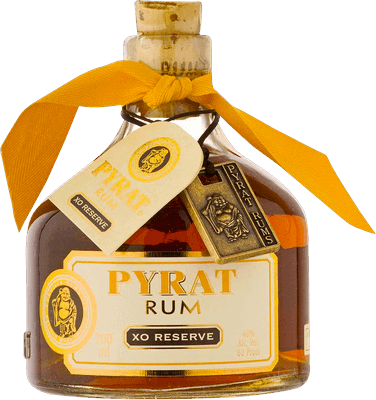 Pyrat is a great rum to add to your collection. When drank straight up it has a smooth pleasurable taste. Light sweet warm spice flavor, great aroma and a very unique bottle. I highly recommend this my favorite rum. Que ce soit à l'odeur ou au gout, j'ai l'impression de boire du grand marnier. Ce rhum sent beaucoup trop fort l'orange. A essayer peut être en mix, mais pur ça ne passe pas ! Strong taste with a touch of orange. I didn't care for it with coke, but by itself and on the rocks wasn't too bad at all. Not a bad sipping rum with an expected complexity. I keep this one on my top shelf. Pale caramel color, great nose. Says it's up to 15 yes old but doesn't taste that aged.